Capital Gate is ADNEC’s (Abu Dhabi National Exhibition Company) gravity-defying new tower in the United Arab Emirates capital. Its engineers created an 18-degree westward lean – four times the inclination of the Leaning Tower of Pisa – using complex diagrid structures that were aligned geometrically using Tekla BIM software. Tekla software has been used to detail some of the world’s most iconic buildings. Its three-dimensional modeling functions allow for making gravity-defying architectural designs a reality. The 3D coordinates for each diagrid component of the Capital Gate tower were calculated using Tekla Structures, which ensured seamless integration and assembly of the frame and its supporting beams. 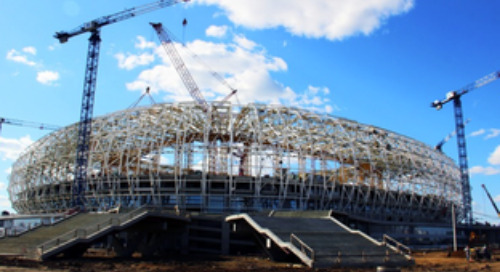 “Tekla solutions help craft even the most complicated designs, and Capital Gate is yet another example of Tekla’s ability to help Eversendai design and model iconic marvels,” said Tahir Sharif, Managing Director of Tekla in the Middle East. Capital Gate is a 35-storey illustrious iconic tower of 525 feet, part of the Capital Centre development around the Abu Dhabi National Exhibition Centre. It features a presidential-style luxury hotel and office spaces. Leaning towards one direction to an angle of about 18 degrees, the tower has been nominated for the consideration of Guinness Book of World Records as ‘the world’s most inclined building’. The structure features a cantilevered internal atrium at 17th and 18th floors to accommodate the facilities of the projecting swimming pool and tea lounge. 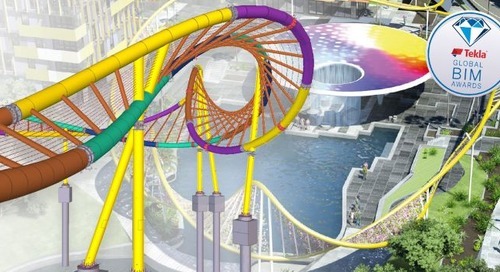 Diagrid technology has been adopted in the construction of the structure. Each diamond of the external cladding is supported by the steel diagrid panel. To maintain the required curved surface profile, every panel surface is slightly deviating with respect to the adjacent panel surfaces. External diagrid members are of rectangular hollow tubes whereas the internal diagrid members are of circular hollow pipes. External diagrid members provide secondary supports for the wave-shaped ‘Splash’ structure from 19th level down to the bottom, providing an attractive sun shade to the tower. Main structural steel work consumed more than 13,000 tons of material in addition to the metal decking. 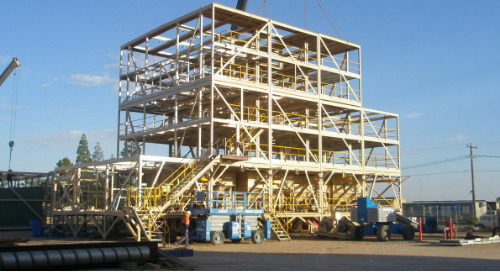 Steel skeleton consists of 702 nodes of external diagrids with an addition of 5 nodes of external dummy diagrids at level 18-18M-19 and 120 internal diagrid nodes at the intersection of the members. At the intersecting nodal points, the hollow members have met with offsets in two axes and floor beam met at the third axes along their surfaces. As none of the panels is coplanar to another, each node is unique and formed with heavy thick cruciform punch through the plates. In order to minimise the member offsets at the nodal points, diagrid members have been oriented by the ‘bisection of bisecting planes’ method. 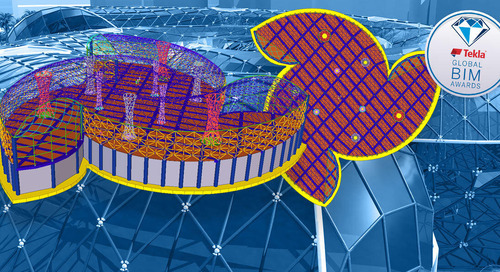 Modeling the complex diagrid members of the Capital Gate tower was managed well with the features of Tekla Structures. The attributes in the software helped to smoothen the construction of the structure. For the design part, the members were oriented with minimal offset by adopting the method of ‘bisection of bisecting planes’. These offset values were taken from the Tekla 3D model and used in the design of cruciform nodes. The lengths of the welds included in the model were used to do the weld design of the cruciform nodes. 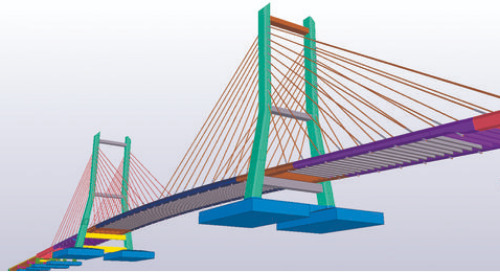 Beams connected to the nodes were moved in the model to avoid member clashing, which could result in eccentric connections. The eccentricity was measured from the model and used in the connection design. The actual cut-to-length measures of the members were taken from the preliminary model developed at the initial stage of the project to procure the material. This helped in reducing material wastage. 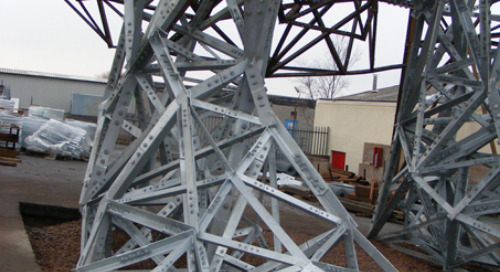 The quantities for bolts, shear studs and paint were obtained from Tekla Structures reports. The assembly lists derived from the Tekla model were converted into worksheets, and other departmental activities, such as fabrication, painting and erection, were planned and monitored using these worksheets. 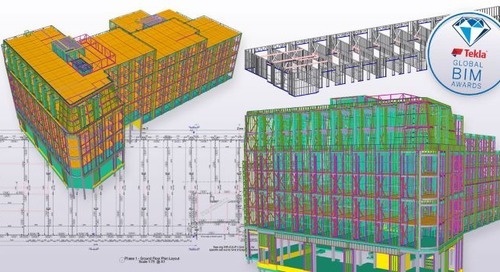 NC files exported from Tekla Structures facilitated faster and more accurate fabrication. For the fabrication of diagrid members, temporary jigs were made with the help of coordinates of individual assemblies that were taken from the model. Fit up of the individual parts of the nodes was done with the 3D coordinates taken from the model. Location of centre of gravity and weight of individual assembly were taken from the reports. These were used to work out the lifting method statement and in the design of erection engineering. A bolt report based on the assembly marks helped the rigging team to have control over bolt usage. The global 3D coordinates taken from the Tekla model were utilised for erecting the diagrid assemblies at their exact position. After this, the Tekla model was passed on to the cladding team to work out the design of the cladding system. 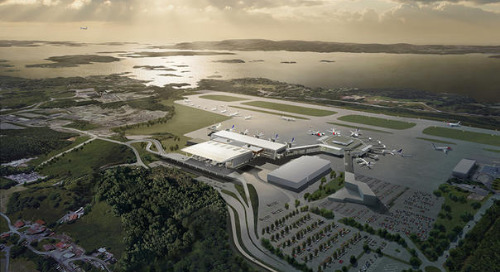 The model was used to coordinate with the architectural profile model to nullify interface issues. 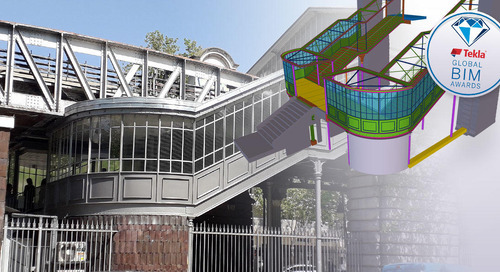 Thus the model generated in Tekla Structures played a vital role also in completing the works in a safe and faster way.